This is the fourth in a four-part theme week focused on the Spanish Flu and the newly launched Defining Moments Canada project. As I was working on a family archival project for a client this month, I learned about the passing of his great uncle, Alfred Benjamin Geldzaeler, from influenza in late October 2018. Alfred, or “Alfie” as he was affectionately referred to by family and friends, was born in Toronto in 1901. He was the youngest of Mark and Jetty’s six progeny. 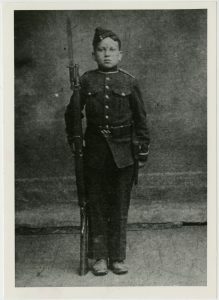 Alfred Benjamin Geldzaeler in his cadet uniform at Central Tech High School, ca. 1912. OJA, item #1232. The couple were Austrian Jewish immigrants who settled in Toronto with their respective families during the late 19th century. Mark was a Hebrew scholar who served as a teacher and caretaker for Holy Blossom Synagogue on Bond Street. For many years, the family resided behind the synagogue. When Alfred, the darling of the family, perished at the age of 17, the family was devastated. 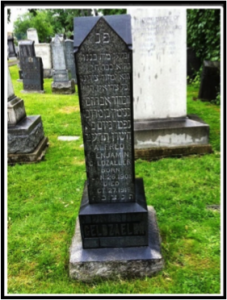 Alfred was buried according to Jewish law and interred in the Pape Avenue Cemetery, the city’s oldest Jewish cemetery. Pape Cemetery monument for Alfred Geldzaeler. The date on the monument is Oct. 27, 1919. Since monuments are unveiled a year after death, it’s possible they inscribed the unveiling date rather than the date of death by mistake. Alfred was one of 50,000 Canadians whose lives were prematurely snuffed out by the virulent Spanish flu pandemic of 1918-19. Despite its magnitude and impact, capturing and conveying this historic event to young people in a comprehensive, dynamic, and engaging manner is an incredible challenge. This is something that the team members of the Defining Moments project will need to grapple with this year. 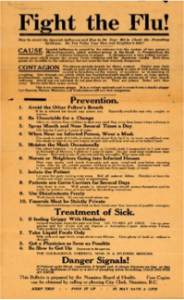 The coordinators of this initiative, Neil Orford and Blake Heathcote, outlined the project and its objectives in an Active History post “Commemorating the 100th Anniversary of the Spanish Flu Pandemic: Testaments.ca” last fall. The primary role of my company, Heritage Professionals, will be to identify and secure primary sources around the country documenting the pandemic and, subsequently, produce some of the historic texts and stories about the outbreak. As an archivist and historian who specializes in Canadian women’s, labour and immigration history, my priority will be to root out untapped sources and recount a broad range of stories from across the country that help bring the voices of marginalized individuals, groups, and communities to the fore. Since one in three Canadians were infected with the Spanish flu during the pandemic, most of us have ancestors that were touched by the event. Beyond this connection to the past, almost every Canadian has experienced and survived milder cases of the flu. It is therefore an historic event and phenomenon that is incredibly dramatic but quite relatable to youth. The Canadian literature pertaining to the pandemic is interdisciplinary in nature and quite voluminous. For many decades following the outbreak, most scholars either addressed the outbreak as part of the narrative of the First World War or ignored it entirely. American scholar Nancy Bristow, author of The American Pandemic: The Last Worlds of the 1918 Influenza Epidemic, argues that a type of “public amnesia” afflicted society after the event, likely prompted by the trauma involved as well as the overwhelming sense of loss and defeat. 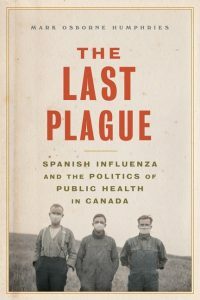 Canadian historian Mark Humphries provides a useful historiographical review of the Canadian literature in his work The Last Plague: Spanish Influenza and the Politics of Public Health in Canada, dividing the literature into three groups that date from the 1970s until the publication of his book. The first wave included authors like Eileen Pettigrew and Janice Dickin McGinnis, who focused on the horrors of the disease in a fairly broad fashion. The second much larger wave in Canada emerged mainly after the pivotal September 1998 international conference commemorating the 80th anniversary of the Spanish flu epidemic, held at the University of Cape Town in South Africa. The AIDs and SARS epidemics also inspired scholars to delve into this neglected topic. This later wave of scholars from disparate fields like anthropology, epidemiology and history relied on new methods, models, and sources. They also narrowed the focus to cities, communities and groups that were afflicted by the pandemic. This includes studies examining major metropolises and smaller locales like Kenora, Ontario and Norway House, Manitoba, along with analyses of particular groups – First Nations, immigrants, workers and women – that had long been omitted from earlier narratives. To redress this situation, Humphries adopts a more expansive national narrative of the pandemic, casting the Spanish flu in the leading role and considering the long-term implications of the crisis. His work tackles this tale through the prism of medical, social, military and political history and deftly reveals the shortcomings of the existing public health system at the time, which was de-centralized and focused on quarantine. The pre-pandemic era, he argues, was one where immigrants were often targeted and blamed for contaminating the population. Rather than originating from immigrants, Humphries reveals how the virus was introduced to Canada and spread across the country via the military. He ultimately pins the blame for the Canadian outbreak on the Canadian Government’s prioritization of the war effort at the expense of public health. When conveying the pandemic to young people, what approach should be adopted that will enable them to process the magnitude of this event without being overwhelmed by the diversity of experiences involved, along with the breadth and depth of this tragedy? Since Defining Moments is a national initiative, it’s imperative that we touch on as many cities and communities across the country as possible, particularly small and isolated ones in the north. Also, it is essential that we cast the story in a manner that they can relate to by including as many facets of the pandemic and personal experiences as possible. This personal more relatable approach will entail recounting the stories from the inside, rather than from the perspective of middle-and upper-class outsiders like health experts, city bureaucrats and politicians. In order to recount these stories, we will need to tap into local and cultural sources such as mainstream and ethnic newspapers, oral histories, correspondence, photographs, ephemera, artefacts and other materials. While scholars sometimes lack the linguistic and cultural expertise to understand and interpret these sources, our army of young students from across the country — which will include youth from a wide range of backgrounds — may be able to build upon family stories and sources that are not accessible to academics. Hence, rather than heeding Humphries’ exhortation and turn our attention outward, the valuable gems that we are hoping to mine actually require retaining a narrow focus and delving much more locally than before. This will enable us to secure the authentic and elusive voices of individuals, families and communities that are missing from the national narrative. Some of the subjects that could be examined at this level include the role that women from different occupations, classes and cultures played in supporting their families and communities throughout the pandemic. Additionally, what was the experience of children who were unable to attend school or participate in other public activities outside of the home due to closures, or worse still, those wee ones who ended up in orphanages after the loss of one or both of their parents? Another topic that offers tremendous potential and interest to students would be the role that home remedies and traditional healers played for different groups like First Nations and immigrants during the pandemic. While some placed their trust in the public health system and medicine, a huge percentage of the population at this time opted for the unlicensed snake oil medicines advertised in newspapers and magazines, or the tried-and-true remedies of their forefathers and mothers. This cough syrup produced by the Laurentic Chemical Products company from Quebec was on the market during the pandemic. It was named after the Canadian Prime Minister and supposedly provided relief for a variety of ailments and illnesses, including the Spanish Flu. 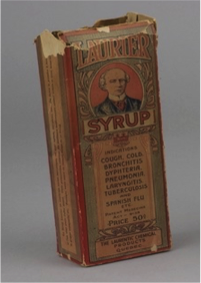 Laurier Syrup box, Canadian Museum of History. 1999.124.138.1, 9274-3202-2864-D2002-012880. And finally, how did different groups perceive death and memorialize their loved ones and brethren? The story of Alfred Geldzaeler offers a useful example of the type of micro-story that could be told to examine death and mourning from the unique experience of a working-class Jewish family from Toronto. Clearly, a project like this one that commemorates an event that transpired 100 years ago that resulted in thousands of deaths nationally and millions internationally could be off-putting and depressing to young people. By adopting short micro-level stories that are accessible, relatable and relevant to what students are grappling with today, we should be able to garner a huge, enthusiastic audience. Furthermore, the student participants who will be curating their own content will not only bring creativity to the project, but just as importantly, their insights into their own families, cultures and regions that will prove to be extremely beneficial to creating a more authentic and holistic portrait of the pandemic. Ultimately the historic micro-stories contributed by scholars and students will fill in existing gaps in the literature and, hopefully, produce a lively and much-needed national dialogue and debate about disease.